When it comes to creating the perfect bedroom for you and your husband, you usually have two options: either you choose each piece separately and combine the pieces yourself, or you buy the whole bedroom set! I definitely prefer the second option! I think it is much easier to just get all the pieces you’ll need at once and after a few hours of assembling, voila! Both of you need space to sleep! Second of all, even if you spend more money investing in high quality solid wood, it will be so worth your while down the road! These bedroom sets are supposed to last for many, many years to come! I prefer the 5-piece bedroom sets in general, because they usually include the two nightstands! I love the cool crafted design and the walnut finish! With a beautiful carved design! 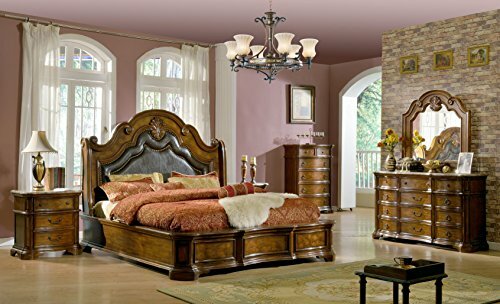 Now if you are looking for a very classy and very elegant European style bedroom set for sale, I think you are going to love this one! 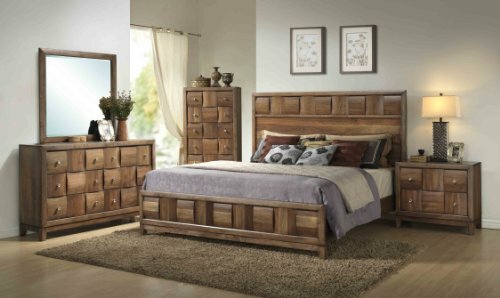 It is a 4-piece solid wood king bedroom set that comes with a beautiful and very tall door chest! It will immediately give your bedroom a very sophisticated look! The bell pull hardware also has a nice antiqued bronze finish! 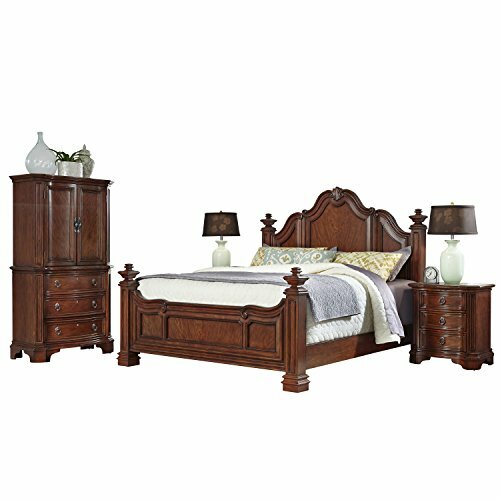 When I saw this stunning 5-piece solid wood bedroom set with this gorgeous and classy arched top and elegant carved scroll design and this gorgeous dark walnut finish I almost let out a scream! Almost like a piece of art! No, actually it is a piece of art! Even though it’s not showing in the picture, it does come with TWO nightstands! (I love the fact that most of these beautiful bedroom sets come with the dresser and the nice mirror too! Another favorite of mine is this elegant black wood 5-piece king size bedroom set for sale. I love the sleigh design king bed! The dresser mirror is also nice and tall, just the way I like it! What called my attention right away was the gorgeous black color! I also love the nickel finish knobs! It is actually the perfect ‘modern meets classy’ look! Made from solid Malaysian oak! 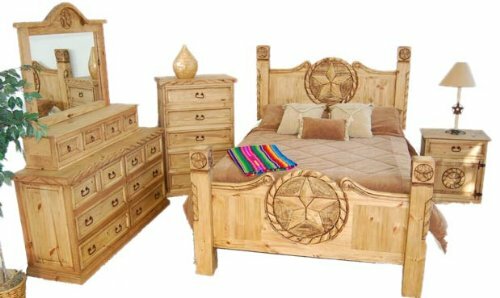 This is a very nice and bright 5-piece solid Malaysian oak king bedroom furniture set! This is the kind of bedroom that will have you looking forward to sleeping in on the weekend! I Love this Antique Tobacco Oak Finish! 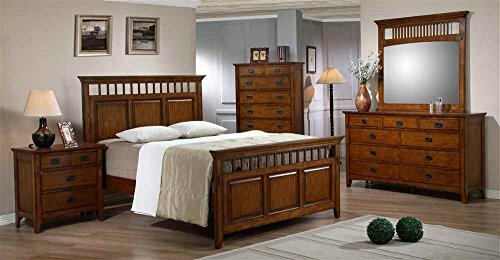 And then I came across this awesome looking 3-piece solid wood king bedroom set in this beautiful antique tobacco oak finish and I went crazy! Look at the elegant, stunning carvings! I love the paneled design on the bed! Just by looking at the picture you can feel it is definitely a very sturdy bedroom set! A gorgeous and very unique rustic bedroom set for sale! 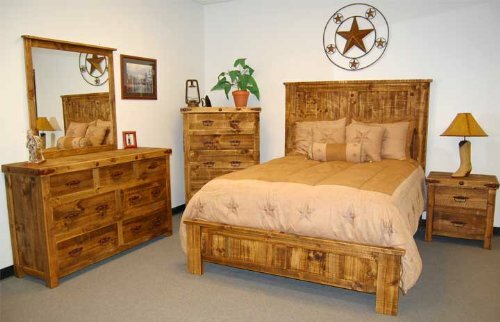 As you can see it comes with the beautiful Texan lone star design king bed, the cool rustic dresser and mirror, the nightstand and the cool rustic chest! I love this wood color! 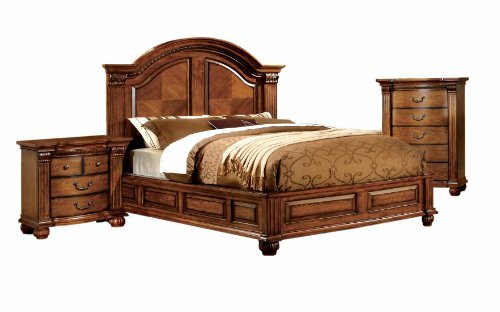 *I truly hope you enjoyed my selections of solid wood king bedroom furniture sets from this page today! Before you leave, I think you also going to love these beds! Luxurious King Size Canopy Beds! My Top Favorite Fancy Beds for Sale!